Choosing occupational therapy can be intimidating. Many of those choosing occupational therapy have decided to do so after several career changes or switching majors along the way. You may not have even heard of occupational therapy before going to college. With that said, programs are becoming increasingly competitive and it may seem that the school of your dreams is a fantasy. You are not alone in this kind of thinking. Remember that everyone has strengths and weaknesses to their application. So, instead of comparing yourself to others, focus on the ways that you can be the best competitor you can be. Here are 10 ways to make yourself a highly competitive applicant when choosing occupational therapy. Attending your professor’s office hours is not only a great way to make sure you’re staying on top of course material, but it also ensures that the instructor knows your name. This can be highly beneficial when looking for helpful tips right before an exam or when it’s time to factor in participation grades. Getting to know your professors will also have enormous benefits. It opens doors for networking opportunities and is a simple way to get a great letter of recommendation. After going to office hours and scoring an A in your prerequisite course, consider reaching out to your professor about being a teaching assistant. This will keep the important material fresh in your mind before going to grad school. It will also beef up your resume! Students are usually compensated with class credit, which means an easy way to boost your overall GPA. Since your major and minor are probably related to OT prerequisites, chances are you can also get credit towards your degree! Make an effort to get familiarized with what other projects the instructor is involved in. This is a course you did well in, so chances are you can benefit by showing interest in the research or clubs that they participate in. Shadowing OTs is an excellent way to not only ensure that choosing occupational therapy was the right decision for you, but also helps you gain a better idea of what setting you might be interested in down the road. By racking up your shadowing hours between breaks, the admissions committee will see that you have been actively learning even when school is not in session. And of course, it always helps to have more than the minimum required shadowing hours. Studying abroad is a great way to help you stand out from the crowd. Many students worry that their coursework cannot be completed abroad, so talk to a study abroad counselor to make sure you don’t fall behind on your studies. If you cannot complete a semester abroad, consider going abroad over Winter/Summer break or for just a week. You can even volunteer or complete an internship abroad that is related to OT or helping others. There are many benefits to joining the American Occupational Therapy Association. The AOTA is the national professional association for occupational therapists, occupational therapy assistants, and occupational therapy students. They hold the national conference annually where OTs discuss the latest relevant research and findings, as well as Hill Day. Membership to the AOTA keeps you informed on the present concerns and accomplishments within the field so that you are up to date on the latest dialogue. Joining will also give you access to scholarship applications, newsletters and student discounts on books and events. Since graduate programs encourage students to join, you will already be ahead of the curve. Student members also have discounted prices to the annual AOTA conference. Many students choosing occupational therapy will neglect volunteer work once they realize they have to complete shadowing hours. Keep in mind that it is important to continue giving back when joining a helpful and caring profession. Find ways to give back to your community, whether weekly or monthly. Reach out to local women’s centers, animal shelters, soup kitchens, hospitals, or nursing homes to see what kinds of opportunities are available to you. One of the most valuable experiences you can have after choosing occupational therapy as a career is having an OT or OT student readily available to contact with all your questions and concerns. If you have an OT program at your undergraduate school, find a professor who is willing to take you under their wing. If your school does not have a program, consider OTs who you have shadowed or reach out to the alumni/networking office to see if there are paired mentoring programs set in place. Have questions ready for your mentor to show them that you are curious about the field and excited to learn. Joining clubs and organizations not only involves you in many community-based volunteer experiences but it also open doors for leadership opportunities. Make an effort to reach out to the executive board and see if they have a position open for you or if you can assist alongside an existing officer. Suggest helpful changes that you would like to see and watch the organizations you are involved in change and grow from the input you are able to provide. When the time comes to apply to schools, it can be tempting to apply to every school in a 200-mile radius. In order to save you time and more importantly, money, make an effort to visit the programs in close proximity to see if the school would be a good fit for you. Many isn’t the right fit for you. See if the programs you are interested in offer information sessions that will give you an edge when it comes time to apply. You can also request to tour the campus and meet with an admissions counselor who can review your application and give you valuable tips on how to get into their program. Prerequisite courses are the foundation of what you will be learning in your graduate programs. Try to keep notes organized and set them aside in a folder/notebook labeled with the course name. Once you retake these courses in graduate school, you will find yourself reviewing a lot of the information. Referencing your study notes from undergrad as a supplement will save you lots of time and can help you recall information much more easily than a dense textbook. Getting organized will also prepare you for the chaos that is a graduate program. Start early on organization so that you can establish an expert routine for when it counts the most. When the admissions committee sits down to review your application, they want to see a generalist - someone who has tried the role of expert student, leader, helper and mentor. Your application has the potential to evoke passion, but only if you give yourself the opportunity to find your interests and roles that suit you best. 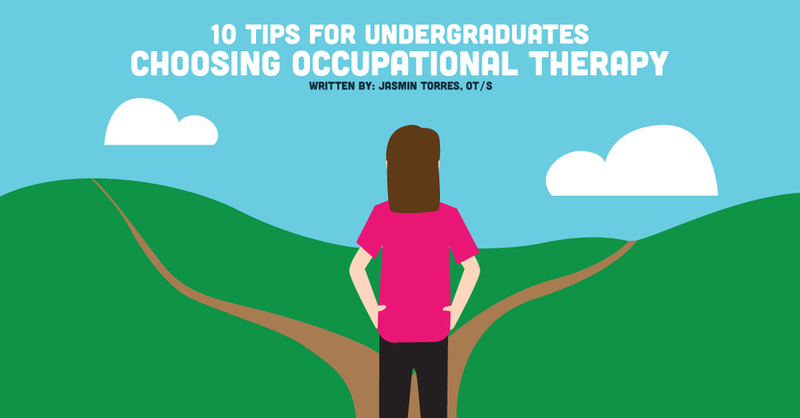 If you are a student choosing occupational therapy and feel that you are in a (getting-into-grad-school) rut, chances are you have some more exploring to do. That being said, the above tips won’t just help you get into a graduate program, they will also help you succeed in a graduate program.